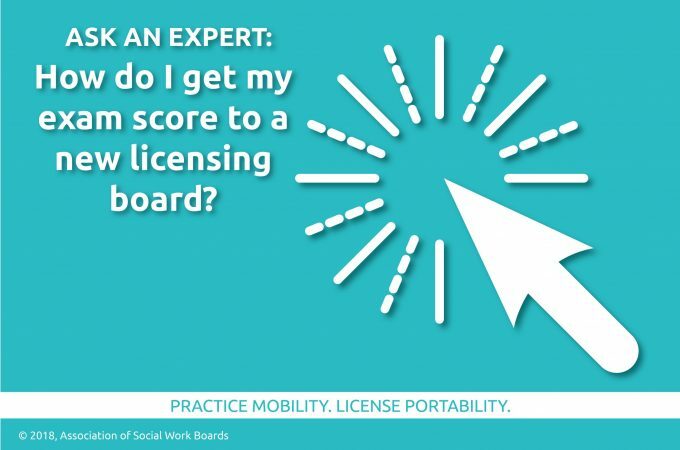 Ask an expert: How do I get my exam score to a new licensing board? About our expert: Tanya Carpenter is ASWB’s director of examination administration. She and her team answer calls and emails in the Candidate Services Center, helping social workers register for the social work licensing exams and access other services. Tanya says: First, always make application with the new licensure board before requesting an official score transfer from ASWB. To make the request or if you need jurisdiction contact information, call Candidate Services at 888.579.3926 or visit https://www.aswb.org/licensees/. And remember, always confirm any information with the appropriate licensure board(s). You may maintain licensure in multiple jurisdictions, so a score transfer doesn’t affect your current license at all!